Below you'll find the Thin Lizzy Biography. It spans from the begining in 1969 through to the fairwell concert in 1983 and mentions most of the various line up members and key events. 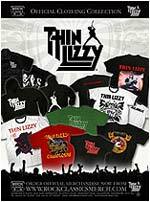 We have also included links to individual pages to four of the longest running band members who we believe became the definative Thin Lizzy. One of the defining rock groups of the 20th Century, Thin Lizzy began life in Dublin in 1969 when childhood friends Phil Lynott and Brian Downey were approached by two former members of Van Morrison's band 'Them', Eric Wrixon (keyboards) and Eric Bell (guitar). 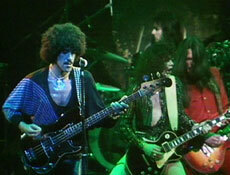 Prior to this Lynott and Downey had been playing together as 'Orphanage', along with Pat Quigley on bass and Joe Staunton on guitar. 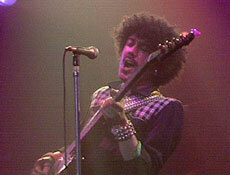 The newly formed Thin Lizzy saw Brian Downey on drums and Lynott playing bass and vocals. Their first release, on Parlophone, came in July 1970. It was an original composition of Lynott's called 'The Farmer'. Out of 500 copies pressed, 283 sold. An inauspicious start maybe, but the band were destined for great things. Signing to Decca Records, their first album 'Thin Lizzy' was released in 1971. Speaking of the group's recording sessions, Bell said: 'We were totally bombed for the duration of that record.' In spite of this, 'Thin Lizzy' and their next album 'Shades Of A Blue Orphanage' were described as intriguing, quirky LPs that tended to defy easy categorisation. Although neither album charted, their early fan based was helped along by DJ Kid Jensen who would feature them on his radio Luxembourg show, and they began to build a strong underground following. During 1972 they toured Europe, but it was only really back in Ireland that their tours provided the funds to keep the band going. Despite this, they knew that if they wanted to break into the wider market they had to persevere with playing in England. 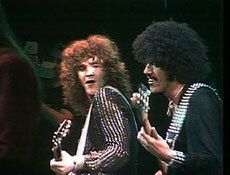 Later that year, Slade went on tour and Thin Lizzy were booked as their support. Decca released a record to coincide with this tour, and chose Lizzy's unique rock version of a traditional Irish folk song: 'Whiskey In The Jar'. Although the song stayed in the top of the Irish charts for 17 weeks and reached number 6 in England, the band were annoyed at being lumbered with a 'folksy' label that they were determined to shake off. Work began on their third album 'Vagabonds Of The Western World' and was released in the autumn of 1973. Combining the traditions of Pop Art on the cover and a yarn about the 'Legend of the Vagabond' along with a shamrock design on the back, this album demonstrated the growing progression of Phil's vision for the group: mystical Celtic meets hard hitting rock. During this period Phil began to take up the creative reins of the band and Eric Bell left the group in 1974. He was replaced by Gary Moore for a few months as they continued with an Irish and then an English tour. A series of dates in Germany followed this, with guitarists Andy Gee and John Cann. 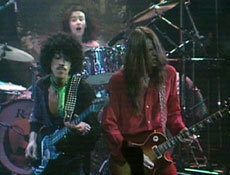 Despite the live work, chart success continued to elude the band and Lynott and Downey were on the verge of calling it a day. Instead they signed up two new guitarists � Brian 'Robbo' Robertson from Glasgow and Californian Scott Gorham, and a new era dawned for Thin Lizzy. The deal with Decca had run its course and the newly formed line-up then signed with Phonogram. Their fourth album 'Night Life' was released in November 1974 and they continued to grind away on the road, honing their act and becoming a tighter and more accomplished group. Their hard work was rewarded with the breakthrough album 'Jailbreak' in 1976 and the single 'The Boys Are Back In Town'. Both were massive international hits with the single hitting number 8 in the UK charts. Reaching the top 20 in the US, the album sales exceeded 100,000 copies � far and away their best success to date. Riding this wave, their next album 'Johnny The Fox' released in October 1976 went gold confirming their status, and the single 'Don't Believe A Word' reached number 12 in the UK charts. Following a sell-out British tour at the end of 1976, the band were all set for an American tour when Brian Robertson was injured and they were forced to cancel. Instead they went to America as the supporting band for Queen, and drafted in Gary Moore as a replacement for Robertson. 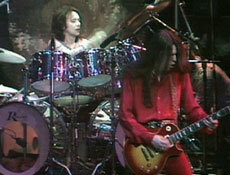 Once the tour had ended, Robertson confirmed he would not be returning to the group and the three-piece of Phil, Brian Downey and Scott went on to record the 1977 album 'Bad Reputation'. In the end Robertson did return to re-join Lizzy during the album recording and stayed with the group doing session work and guest appearances until August 1978 when he finally left to form 'Wild Horses'. 'Bad Reputation' was released in September of 1977 and stormed to number 4 in the UK charts. Coming as it did on the back of 'Jailbreak' and 'Johnny The Fox', this cemented the band's position as one of the most successful rock bands of the time. Thin Lizzy embarked on a US tour in the autumn of 1977 and the following year they began mixing work on a double album 'Live and Dangerous'. They strived to recreate the energy and excitement of their stage performances in the studio and the album was a hit on both sides of the Atlantic. The track 'Still In Love With You' is considered by many to be a highlight of Phil's career. Later in 1978 they took off for another US tour, this time with Gary Moore replacing Robbo once again. Also absent was Brian Downey. 'I was totally exhausted', he said. 'I just couldn't take it anymore. I didn't want to see another stage again, and I certainly didn't want to go on to Australia, as had been proposed.' The band booked drummer Mark Nauseef, who had been playing with the Ian Gillan Band, as Brian's replacement for the tour. At the end of the 1978 tour, Phil, Scott, Gary and a now rested Brian Downey came together in London and Paris to work on the next LP, 'Black Rose � A Rock Legend'. Released in 1979, the central piece of the work was the title track, in Gaelic 'Roisin Dubh'. Back on the road in the US, frictions within the band grew and resulted in Gary Moore being replaced by Midge Ure half way through the tour. Guitarist Dave Flett, ex-Manfred Mann's 'Earth Band', was also bought on board for the dates in Japan, which enabled Midge to switch to keyboards for some songs and saw the phenomenon of three lead guitars at the front of the stage. Following the tours, Darren Wharton was recruited as a full-time keyboard player enabling Midge to honour his previous commitment to join a new group, Ultravox. Dave Flett was replaced by Terence Charles 'Snowy' White in 1980 who also debuted on that years 'Chinatown' album, but ultimately gave way to John Sykes who brought with him the younger energy needed for a Thin Lizzy guitarist. 1980 also saw the release of Phil's first solo album 'Solo In Soho'. The track 'Yellow Pearl' was subsequently chosen as the theme tune for BBC's Top Of The Pops. Although billed as a solo album, it included Brian, Scott and Snowy White as well as Midge Ure, Mark Knopfler and Huey Lewis among others. 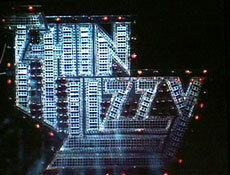 'The Adventures Of Thin Lizzy' was released in 1981 and went gold in the UK. This was followed by the new album 'Renegade', together with a tour. 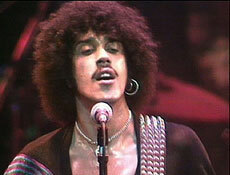 Thin Lizzy also headlined the very first Slane festival in Ireland supported by U2, Hazel O'Connor and Rose Tattoo. Disappointing sales of both 'Renegade' and Phil's second solo album precipitated a farewell tour to coincide with the release of 'Thunder And Lighting'. 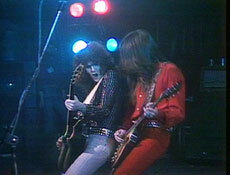 Both the new album and the live dates in fact proved extremely popular and caused a resurgence of interest in the group. With John Sykes now on board the tour lasted nearly a year and culminated in a gala performance at the Hammersmith Odeon featuring special guests Brian Robertson, Eric Bell and Gary Moore joining Phil and the band. The 1983 double live album 'Life' included this gem from the tour but suffered from a delayed release. Thin Lizzy's final UK show was on 28th August 1983 at the Reading Festival. Their farewell concert came on 4th September that year at the Monsters Of Rock Festival in Nuremburg, Germany.